Those that know me today may be shocked to hear that I was a quiet, shy, nerdy kid in high school. Well, at least the shy and quiet part, I probably still have the nerdy part covered. Back then, like most kids, I had no idea what I wanted to do in life. I liked playing with gadgets, but didn’t know how to turn that into a career. One day I heard an announcement about an interest meeting for the school’s robotics team and figured I’d check it out. It’s been over a decade since I walked into that classroom and I’m still involved with the team and the organization. My team is ILITE Robotics, Team 1885 out of Battlefield High School in Haymarket, Virginia. The organization is FIRST, For Inspiration and Recognition of Science and Technology. Both have changed my life in ways I can’t even begin to describe, but I guess I’ll try. Joining ILITE gave me a path in life, I gained experience in all kinds of real-world scenarios. FIRST teams run like a small business, there’s teamwork, production, leadership, web design, presentations, social media, advertising, budgeting, community outreach, charitable work, and so much more. I got to experience and have a hand in all of it. When I left high school, I had more real world experience than I could imagine. I’d seen projects succeed and fail, I’d worked on teams large and small and I’d worked with people with all sorts of interests. Today, some of my most trusted friends are FIRST alumni because we all experienced the same thing. While I had no problem leaving high school behind, I couldn’t just leave the team. When I was in college, I stuck around FIRST and ILITE, mentoring some of the younger teams. As I got older, I began mentoring the older kids as well. Things change dramatically when you switch from mentee to mentor, you start looking at the world differently. Should I let them design that part incorrectly? Can I just fix it for them? Do I let them make the same mistakes that I did? There are all sorts of theories on this, but the more I’ve worked with these students, the more I think we should let them make their own mistakes and be there to help students learn from them. This is what FIRST is all about. I’ve mentored elementary, middle, and high school students for years now. Some of whom I mentored through the full progression of programs. They’re like family to me now, my second family, but a FIRST family. I’ve been doing this long enough now that I’ve seen the lasting impact FIRST can have on its participants, far beyond just myself. I’ve seen students’ lives completely changed for the better because of the opportunities they were exposed to through FIRST. ILITE alone has produced future programmers, teachers, engineers, artists, and more. Students routinely find internships, scholarships, jobs, through FIRST. It’s something I never tire of seeing. Just because I’m out in Colorado now doesn’t mean I’ve lost touch with my team. In fact, I was just on the phone with them earlier today. We have a video chat scheduled for tomorrow to help prepare them for their presentation at competition. Yet there’s more to FIRST than mentoring, they also need volunteers. The competitions take a lot to run and they’re staffed by volunteers. I’ve done all sorts of roles, judging, announcing, and even refereeing. 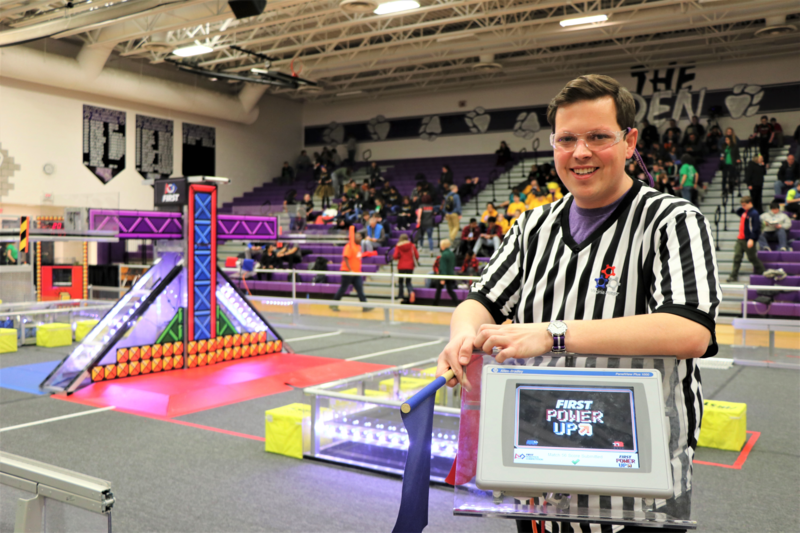 Yup, we have referees, got to make sure the robots follow the rules! The volunteer time commitment is relatively low, usually just a day or two, but I assure, you get more out of it than you give. Witnessing the culmination of what these students have worked towards for months is incredibly rewarding. There are ups and downs, wins and losses. It’s our job as volunteers to make sure the students walk away with their heads high. In my book, showing up with a robot that moves is a win; they’re pretty complicated. I’m a firm believer that everyone should participate in FIRST. There’s a program for every age group in K-12. If you’re too old to be a student, become a volunteer! Swing by a competition sometime, they’re free and open to the public. Be warned though, you might get hooked! Jacob Cohen is a Solution Architect at HarperDB where he works with customers to build and implement solutions. In fact, he uses a lot of the skills he honed in FIRST during his day-to-day activities. HarperDB is an IoT edge database designed for edge decision making, distributed computing, and data analytics scenarios.